Convenient, easy shoe shopping experience – simply walk into the on-site, mobile showroom to browse, get fitted and purchase on the spot. Employer peace of mind that personnel are properly fitted with the perfect footwear for the job. We operate a fleet of 46 shoemobiles. These stores on wheels offer customers ample room to review our products, interact with mobile store managers, and sit down while they try on new safety footwear. 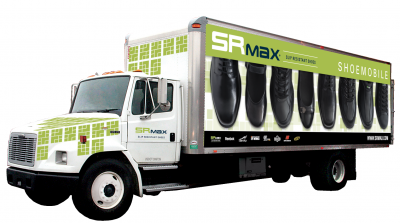 Each shoemobile carries a minimum of 1600 pairs of safety shoes. Additionally, each truck is stocked with the customer's specific needs in mind. We offer following "customer-specific" shoemobile services to assist you. We believe it is a privilege to be invited to your work site. When we visit, we will prepare each shoemobile specifically to serve you and your team! Please note that Shoemobile services are offered to businesses that develop a direct employer billing program and wish to buy in bulk. If you are an employer interested in outfitting a group of employees all at once, Contact us to arrange for one of our Shoemobiles to visit your worksite.